I guess I'm just going to have to disagree with Henry David on this one. 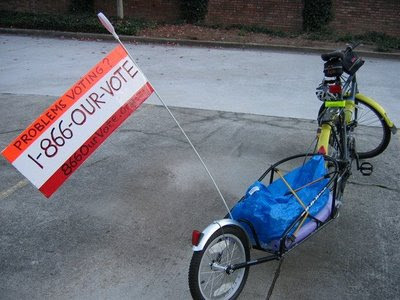 Tomorrow is election day and if the Obama Obicycle stays dressed up as a partisan campaign counter-puncher then any area within 150 feet of a polling place would become a no-fly zone, so to speak. Your polling place opening late or closing early? Then give 1-866-OUR-VOTE (same as the number above) a call. Faulty equipment or voting machines there? Do likewise. Challenged because of lack of photo ID or mix-up on the registration rolls? They can help. If the circumstances warrant, and if one is available, an election protection volunteer will be dispatched to your precinct to try to resolve the problem. Provisional ballots are a LAST resort because they will only be counted if the county clerk can verify your registration status before the election is certified. So it is a priority is to find a way to vote coventionally or by paper ballot, if at all possible. We all have come this far with registration and campaigning. Now it's time to make sure that our precious votes - and those of our our friends and neighbors - are counted. Please, share this information with anyone who may need a hand tomorrow. It breaks my heart that the Obicycle is no more. The new Nonpartisycle is not as much fun.